La Scala - Teatro alla Scala is an opera house in Milan. 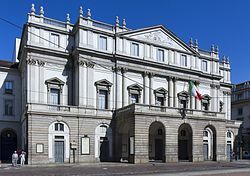 The theatre was inaugurated on 3 August 1778 and most of Italy's greatest operatic artists, and many of the finest singers from around the world, have appeared at La Scala during the past 200 years. This article uses material from the Wikipedia article "La Scala", which is released under the Creative Commons Attribution-Share-Alike 3.0 License.